Below are historical photos of the I-10 West/US 87 freeway. These photos were compiled from a number of sources including old San Antonio-Bexar County Urban Transportation Study (SABCUTS) planning documents, the TxDOT photo library, the San Antonio TxDOT district office, and the personal collections of the myself and of a former local Highway Department engineer. Locations are given using the present-day roadway names. The photos are arranged roughly from downtown outward. Click here to return to the historical photo galleries page. Click here to return to the I-10 West media gallery page. At this time, I-35's predecessor (the US 81 expressway) had not been built, so the expressway simply curved to the south at what is now the "Downtown Y" interchange downtown and terminated at Martin St. The small black & white sign on the right edge of the roadway just ahead simply reads "Expressway" with a right arrow. Just beyond that is a pedestrian bridge, and just past that is a left hand exit for Santa Rosa Blvd. that is in the same approximate location as today's left hand exit for Santa Rosa Blvd. from the I-10 access road. This location is a little further west than the one above. Looking northwest over the curve at Culebra Ave. Note the grassy median here at this time. Again note the grassy median in place at the time. 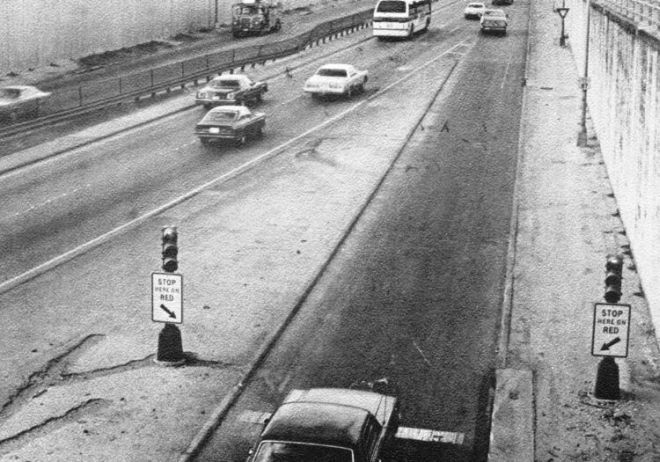 There used to be bus stops on both sides of the I-10 mainlanes at Cincinnati. This is a picture of the northbound bus stop. This picture shows the southbound bus stop. The grassy median was being replaced with safer concrete and steel guardrail. You can see the aforementioned southbound bus stop on the left. We also get our first view of the arched pedestrian overpass that's still in use today. At the pedestrian bridge north of Cincinnati Ave. This is the east side of the freeway. All ramp meters in this area were removed during double-decking of the freeway in the late '80s. The ramp on the right is the same one in the photo of the ramp meter above. At this time, the freeway ended just past the Woodlawn/Fredericksburg underpasses. You can see just past the underpasses where is turns to the left and climbs-up to Fredericksburg Rd. At Woodlawn looking northwest along Fredericksburg Rd. By this time, the freeway had long since been extended northward. 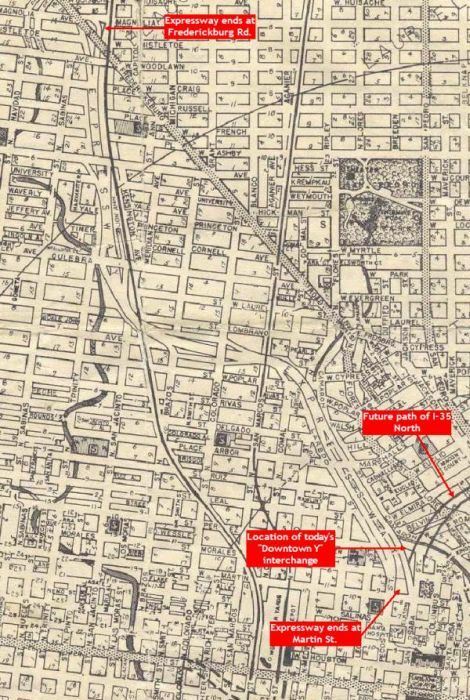 This area is where the double-decked freeway starts today. The curved wall between the freeway and frontage road near the bottom center of the picture was part of the Magnolia St. curve discussed above. Note the drainage channel in the median; this is Martinez Creek. The creek runs under the current-day freeway between West Ave. and Fresno. Pedestrian overpass between West Ave. and Fresno Dr.
Again, note Martinez Creek in the median. Looking northbound (now westbound I-10) near Crossroads Blvd. I-10 outside Loop 410 was still under construction, and work on I-10 inside 410 had not even started yet. The roads in this photo are now the frontage roads for I-10 West. This picture was taken from the top of the hill approaching DeZavala on the westbound side. You can see DeZavala itself on the right near the third-furthest vehicle. 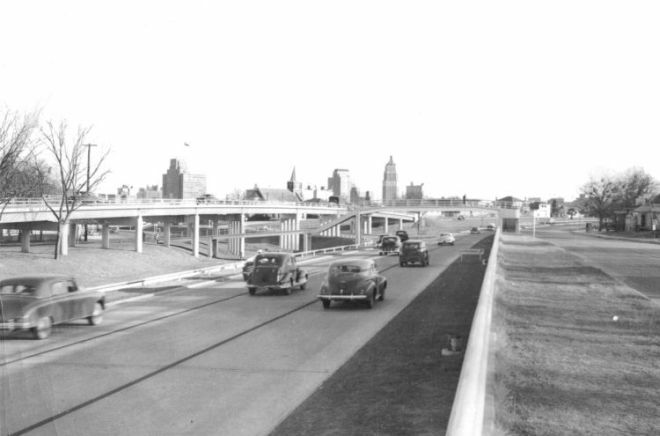 The inward "bracket" indentions of the frontage roads in the distance are still in place today between DeZavala and UTSA Blvd. If you found this informative, please consider making a small donation to help support it. Thanks!